Carbon filters are widely used to remove unwanted odors and smells. Carbon is a popular component in water and air filters as it does a great job at removing impurities and unwanted nasty odors. Installing a carbon filter is essential if you are growing your own indoor plants especially cannabis and flowers. Growing plants involves using fertilizers and pesticides that are very beneficial for the plant but will cause a foul odor that can linger. If you are looking for the best carbon filter for grow room then you’ve come to the right place. Whether you are growing cannabis or your own edible herbs and plants, you might end up dealing with a nasty smell that travels beyond your grow room. This strong odor will make it inconvenient to grow your plants at home. This is why it is a wise decision to invest in an excellent carbon filter. If you are fond of growing cannabis, flowers or other plants in your own grow room, then this article is for you. 1 Why do you Need to Buy the Best Carbon Filter for Grow Room? 2 How to Pick the Best Carbon Filter for Grow Room? Why do you Need to Buy the Best Carbon Filter for Grow Room? Eliminating bad odors is essential for the health of everybody living in your household. Growing your plants is great but the stinky smell can be to endure. Water, pesticides, insecticides, and fertilizers provide great benefits to your plants but they cause a lingering unbearable smell that will be extremely uncomfortable in the long run. A carbon filter will improve the quality of the air in your grow room and your house as a whole. It also eliminates compounds that can make your plants sick. Humidity and heat create the perfect environment for fungi and bacteria to grow. Removing these impurities means that your plants will always be in perfect health. How to Pick the Best Carbon Filter for Grow Room? Carbon filters are very popular among people who grow flowers, cannabis, and hydroponics. This is because growing plants in an enclosed environment can cause a lot of annoying odors. These filters are versatile and can be used for a lot of other applications. The housing of the carbon filter should be made of a sturdy metal that can last for long. Aluminum is lightweight and quite affordable. It is one of the best options if you want to buy a budget-friendly filter that doesn’t cost much. Steel filters are more durable but they are also more expensive. You need to make sure that your filter is designed to resist corrosion. Planting cannabis, flowers, and other plants in your grow room involves using a lot of chemicals. These chemicals might cause corrosion that will affect the performance of your carbon filter. You need to make sure that the body of the filter is properly protected and coated. Activated carbon is one of the most absorbent materials on the planet. It can absorb smoke, pungent smells and different impurities that affect the quality of air in your house. Carbon comes from different sources and some types are more absorbent than others. You need to make sure that your carbon is of high-quality and is machine packed. Machine packed carbon means that there will be no movement in the particles which will ensure that all the contaminants are properly filtered. A cone-shaped design will maximize the airflow. You need to make sure that your carbon filter is designed to deliver clean and fresh air by absorbing air from all directions. Open mesh guarantees that better air will be delivered in your grow room. Some models are potent at doing the job due to their open mesh design. This will guarantee that they are better at controlling odors. You are mainly buying your carbon filter to install in your grow room. But good filters can improve the quality of air anywhere you choose to install them. A good carbon filter will remove the annoying smells from your kitchen or bathroom. You can also install it in the storeroom that has been locked for years in order to improve the overall quality of the air. Good filters can be combined with strong fans that will deliver better and cleaner airflow. Make sure that you buy a good model that will keep the air smelling clean and fresh. The first product on our list is the best carbon filter for grow tent. It contains activated carbon which does a great job at absorbing bad odors and impurities. It features a 4-inch flange duct and has a length of 12 inches. The airflow is 200 CFM to guarantee the best performance. The reason this product is extremely popular is that it uses 1050+ IAV Australian RC412 Activated Carbon. This is one of the most absorbent carbons in the whole world. It does a great job at absorbing bad odors that can affect the quality of the air in your grow tent and house. It is supposed to last for up to 2 years cleaning the air and keeping it smelling fresh. The reversible flange means that you can flip it upside down for an extended use. The pre-filter lasts for up to 6 months and needs to be replaced to guarantee that the quality of performance. The filter comes with 53% open area which means that it is effective in odor management. The filter is designed to soak up and eliminate the bad smells and chemicals in the air. This product is very easy to set up. Installing this carbon filter will improve the quality of the air in any room. It increases the airflow and keeps your grow room clean and healthy. Contains one of the most absorbent activated carbons. Reversible flange for an extended use for up to 2 years. 53% open area for better odor management. Eliminates bad smells and chemicals. It is a bit too loud. Finding the best carbon filter means that you will have fresh air in your grow room and all around the house. This product is packed with RC-48 activated certified virgin carbon bed which does a great job at absorbing annoying odors that can affect the quality of the air in your tent. Although the price of this filter is steep compared to other products, it can be easily justified by the amazing features and benefits it provides. You can expect the carbon to have minimal movements because it is machine packed so it keeps on performing its job for a very long time. The Anti Air Bypass system guarantees the best air circulation. This will remove the foul odors in your grow tent by purifying the air. The top and the base are made of high-quality lightweight aluminum that is meant to last for long. The cone-shaped internal base optimizes the airflow. It features 51% open air custom mesh for better odor management. It comes with batteries and is very easy to install. Packed with virgin carbon to absorb bad odors. Minimal movement for better performance. Anti Air Bypass for optimized air circulation. Open air custom mesh for better odor management. More expensive than other products on the market. You can improve the air circulation in your grow room using this product. 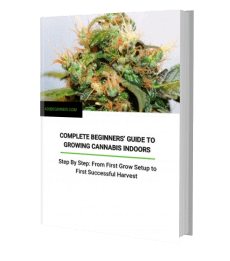 By installing the best fan for grow tent, you will be able to get rid of all the nasty odors to keep your grow room and house clean. This combo features a high-quality carbon filter and a fan to remove the nasty smells. The filter features 1050+ RC 48 Australian Virgin Charcoal Bed which does a great job at absorbing odors and impurities from the air. The powerful airflow fan moves the air in your target location at 2450 RMP. Whether you are growing cannabis or have a hydroponics grow room, you have to use this efficient carbon filter to get rid of the pungent odors that can make life uncomfortable. The filter and fan work together to improve the airflow of filtered air thus improving the condition in your grow room. The filter features a reversible flange making sure that it will last for long. With regular cleaning and maintenance, the filter can last for up to 2 years. The 53% open mesh design guarantees better airflow. Installing this filter is a must even if you don’t have a grow room. This is a versatile product that you can install in the kitchen, bathroom or greenhouse. It is also suitable for industrial applications and can be safely installed in hospital rooms. A carbon filter and fan in one package. Australian Virgin Charcoal that absorbs impurities. 53% open mesh to improve the airflow. Are you looking for a high-quality and budget-friendly carbon filter? Look no more. This amazing product comes in 3 different sizes to cater to various needs. It features a pre-filter design which does a great job at eliminating annoying odors in your grow room or anywhere you choose to install this product. The filter is made of a galvanized sheet which is more durable than aluminum. This means that it can endure different conditions and is going to last for a very long time. The premium zinc-anodized steel doesn’t get affected by the chemicals that are usually used in grow rooms. The filter is designed to resist corrosion and to purify the air in your grow tent, kitchen or bathroom. It functions using 1050+ IAV Australian Virgin Charcoal Bed which absorbs impurities and pungent odors. The packed carbon is guaranteed to deliver 99.8% filtered air. The outer mesh is designed with 53% open area to optimize the airflow in your grow tent. Your plants will grow faster and stay healthy while you can enjoy the fresh and clean air. This filter can be easily paired with a fan for an improved air quality. Galvanized sheet carbon filter that resists corrosion. Contains 1050+ IAV Australian Virgin Charcoal to absorb impurities. 53% open area for optimized airflow. Can be paired with a fan. You will need a bigger size especially if you have a big grow room. This is the best carbon filter for grow room if you are looking for an affordable option. It is designed to eliminate the pungent odors in an enclosed environment in your grow room. This will help your plants grow faster and healthier. This amazing filter will keep your grow room clean and your house healthy. It features 1050+ IAV Australian raw charcoal which is one of the most absorbent materials. It eliminates ill-smelling particles that affect the quality of the air in your grow room which spreads to other parts of your home or facility. The cone-shaped design guarantees the maximum utilization of all the activated carbon for best results. The flange and bottom are reversible. This means that you can reverse the charcoal canister to make sure that it will last for long. This feature provides extended and improved use. This is a versatile product that can be used for various applications. Whether you install it in your grow room, your kitchen or bathroom, you will always be able to enjoy the fresh and clean air. Features Australian raw charcoal to absorb bad odors. Cone-shaped design to maximize the use of the activated carbon. The filter flange and bottom can be reversed for longer use. Should be used with flexible venting as the flange is slightly larger than 4 inches. This wonderful HEPA filter is guaranteed to deliver the cleanest and healthiest air. It is the best choice for anyone who wants to have the cleanest indoor room. It works to remove impurities from your grow room or anywhere you choose to install it. This filter features 5 efficient technologies that can purify the air and improve its quality. It features a Pre-Filter, an H13 HEPA Filter, an Active Carbon Filter, a UV and TiO2 Photocatalytic Filter, in addition to an Ionizer (Anion) to improve the quality of the air. The pre-filter filters out the big particles. The HEPA filter removes almost 99.97% of the 0.3 microns while the activated carbon filter removes the nasty odors. This means that you will be able to enjoy excellent air that will help your plants grow faster. You can install this filter in your kitchen, barn, or anywhere you want to remove annoying odors. It offers a 360-degree air intake and this means that it will last for long. You can set this filter up to work for as long as you need it to by using the timer. It also features a sleep mode and an auto mode for maximum convenience. You can pick between 5 different speeds to provide the best air quality. Using this filter guarantees that you and your indoor plants will always have access to clean and fresh air. The filter features a special display that shows how pure the air is. Utilizes 5 different technologies to improve the quality of the air. HEPA filter removes airborne impurities. Activated carbon filter eliminates nasty odors. You will have to use the highest setting to remove the nasty odors, especially in a big grow room. This is a high-quality product that features top grade RC-48 Charcoal Carbon from Western Australia. It does a great job at eliminating odors and removing the pungent smell from your grow room or greenhouse thus improving the health of your plants and the overall quality of the air. The active carbon is machine packed with small granules. This means that it contains almost 15% more than the activated carbon that you can find in other products. It is specially designed to eliminate bad odors in your grow room or tent. Combined with a high-quality fan, you will be able to enjoy fresh and clean air that will help your flowers, hydroponics, and cannabis grow faster and healthier. Moreover, this filter can be installed anywhere in the house where you want to have access to clean and fresh air. For the price you pay, you will receive 2 washable pre-filters. The aluminum flange and base are very easy to install. You will be able to enjoy better performance thanks to its sleek design and high-quality components. High-quality aluminum flange and base. Features top grade RC-48 Charcoal Carbon from Western Australia. Comes with 2 washable pre-filters. There is likely going to be some charcoal around the housing. Buying and installing the best carbon filter for grow room is a must if you are growing cannabis or flowers in a grow room. A good filter will improve the quality of the air to help your plants grow faster and healthier. It will also remove the pungent smell that can annoy you in the long run. By going through our article, you will be able to have a good idea about some of the best products on the market. Make sure that you buy a high-quality product that will remove annoying smells while improving the quality of air. Your plants will stay healthy and your grow room will always smell clean and fresh.